One of UA’s large lecture classrooms. 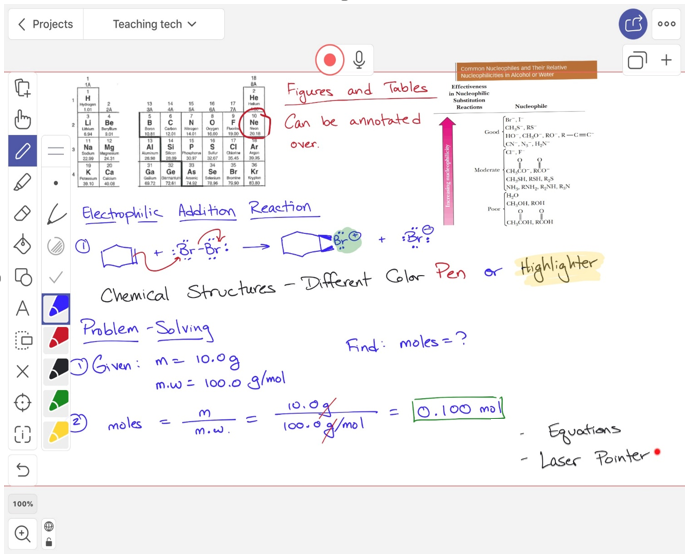 Since chemistry is a visual subject, where structures must be drawn out, problems worked through, and equations presented, the use of handwritten notes is critical. During my time at in the Department of Chemistry and Biochemistry at The University of Alabama, I have taught in a range of classrooms: from a small 80-seat room to larger 400-seat lecture hall. My teaching style relies on the use of a whiteboard to provide handwritten notes. I believe the use of handwritten notes allows students time to process the information as the instructor is writing, and reiterates the information when students are actively copying it down in their notes. This need is not unique to chemistry: many other disciplines taught on this campus has such requirements, spanning from math and physics, all the way to textile design. 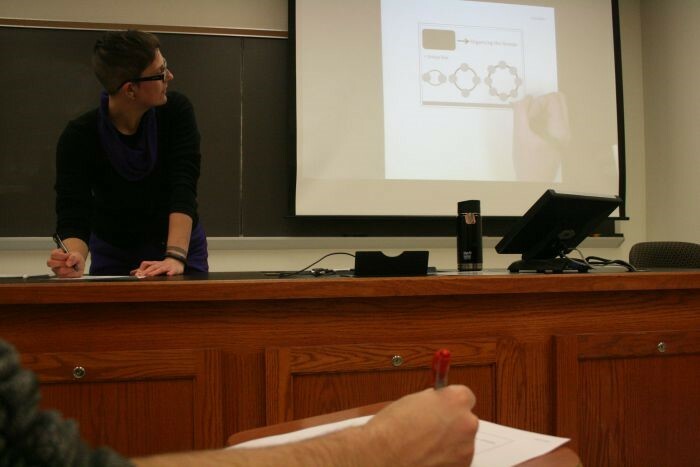 The use of a physical whiteboard is impractical, however, in large lecture halls (e.g., North Lawn 1000, Russell Hall 159, ten Hoor 125, Biology 127). These rooms present a challenge to faculty who want to provide handwritten notes during their lectures because students are simply too far from the front of the room to see handwriting on a physical whiteboard. The only way to present materials to students in these lecture halls is through some form of video projection. All of these rooms are equipped with large projector screens that are visible to students throughout the classroom. I have used a number of technological tools in these classrooms to try to overcome this obstacle: document camera, the original Smart Podium, the Wacom Smart Podium, and an iPad. I thought it would be useful to list the pros and cons of each technology based on my experience. 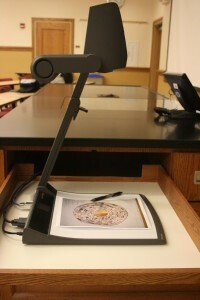 The document camera is a device above a paper, which captures your handwritten writing and projects it to the screen. To use the document camera, reams of paper will be required, where a camera above the paper captures your handwritten writing and projects it to the screen. Easy for the user, with the least technological demands. Users may zoom in to show details. 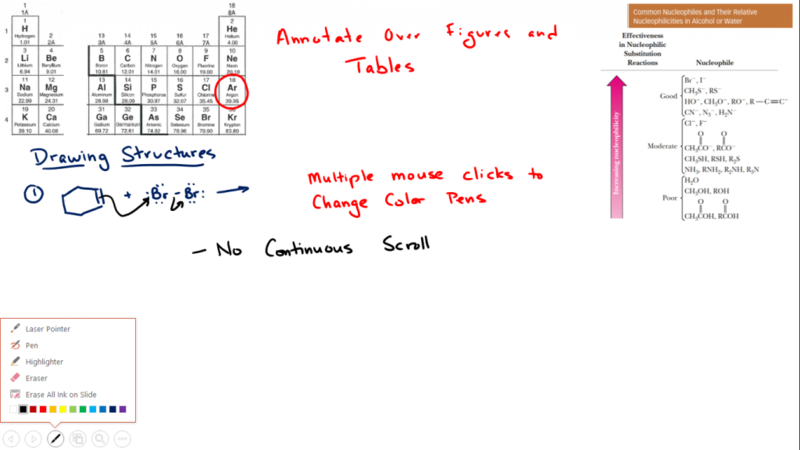 Annotate may be added over printed figures and tables. The hand gets in the way of the camera, covering up the writing as it is being written. This is a critical flaw in chemistry because the process of how structures are drawn is one of the things students need to learn in the class. Users may find difficulty checking whether their writing is within the frame of the camera and being projected. This is a constant hassle for teaching. The resolution of the camera is not as high as electronically generated content (especially color reproduction is particularly poor). For chemistry, I typically use three colors, to highlight key points and distinctions of molecules, but the projected image does not show a significant difference in the colors. In most classrooms, UA has a computer monitor with a stylus (Smart Podium or Wacom Monitor). With the stylus, you can write over electronic documents (PDFs, PowerPoint slides, or Word documents), which is then projected onto the screen. Supplies: Pre-saved blank Word documents, PDFs, or PowerPoint presentations (with multiple pages/slides for continuous writing space). Versatile: notes can be written on figures/tables in PowerPoints, PDF, etc. I was able to place images up and annotate them. Notes are saved electronically, therefore they can be posted for students to access after class. Can choose many color pens, highlighters, pencils, thickness of strokes, etc. Better resolution than a camera; better color reproduction. The electronic stylus is not as precise as a pen. This is an issue with drawing structures, especially for courses where developing good precise drawing style is a necessary outcome of the class for the students. Depending on the setting, some software packages waste a lot of space around the page, for eg. toolbars, rather than just projecting the page and the notes. Changing pen colors in Word and PowerPoint requires a few mouse clicks. This slows you down and artificially interrupts the flow of the lecture. Settings such as page style, pen styles (color, thickness) cannot be saved between lectures, because the computers in these classrooms are reimaged every day. This is a small but repetitive annoyance. PowerPoints gives users more writing space by hiding the annotation tools. However, PowerPoint forces you to separate notes into individual slides. Once you move to the next slide, the content on the previous slide is no longer visible. Word Document gives users continuous scroll through multiple pages; however, this program wastes more of the screen space by showing more tools on the screen. The tools can be hidden, but then changing the color of the pen requires multiple mouse clicks and interruption of the lecture flow. To use an iPad, I use an Apple Pencil (pressure sensitive Bluetooth stylus) to annotate on a whiteboard app, Explain Everything. The iPad is connected to the projector through a Lightning to HDMI converter, alternatively through Apple TV, projecting the iPad screen. Supplies: Apple Pencil stylus, iPad – compatible with Apple Pencil (iPad Pro, iPad 6th Generation or newer), lightning to VGA or HDMI Adapter, a whiteboard app (Explain Everything). The Apple Pencil is a significantly better electronic stylus, compared to the Wacom stylus on the Smart Podium. Similar to the Wacom stylus, it has palm rejection capabilities, so one can draw while resting their hand on the screen, in a natural position. The whiteboard has a continuous scroll: it has an infinite amount of space. Projection of only the whiteboard, not the tools, so no space on the projector screen is wasted. The Explain Everything app provides a very convenient close-up writing mode (called “Stealth zoom” mode in the app). This overcomes a common scaling problem when handwriting is produced on the relatively small iPad screen but projected on the very large screens in the classroom. In fact, normal-size handwriting on the device’s screen would be projected many times enlarged on the room projection screen, taking up too much space. Of course, one could attempt to write smaller on the iPad screen, but I find it almost impossible to write neatly and legibly at a small enough scale. Fortunately, this app’s developers recognized the problem and provided a special tool to solve it, whereby the user can first select an area of the canvas to be projected, then set the “stealth zoom” mode to zoom in to a smaller region of that area and write neatly at a larger size, all without the change in scale being visible to the audience. This allows the user to write at a much more comfortable natural size, which improves the neatness of handwriting and its precision, while at the same time showing the audience enough material on the projection screen. There is no way to reproduce this functionality in any of the Podium-based solutions. In addition to being able to save the notes electronically, the app can record the lecture audio as well as a video, including the whiteboard and the instructor’s voice through the iPad’s microphone. After class, I typically have a long line of students wanting to ask questions about the topics we just covered. However, the next instructor needs to get into the classroom. I am able to take my notes with me and talk as I walk out with my iPad. 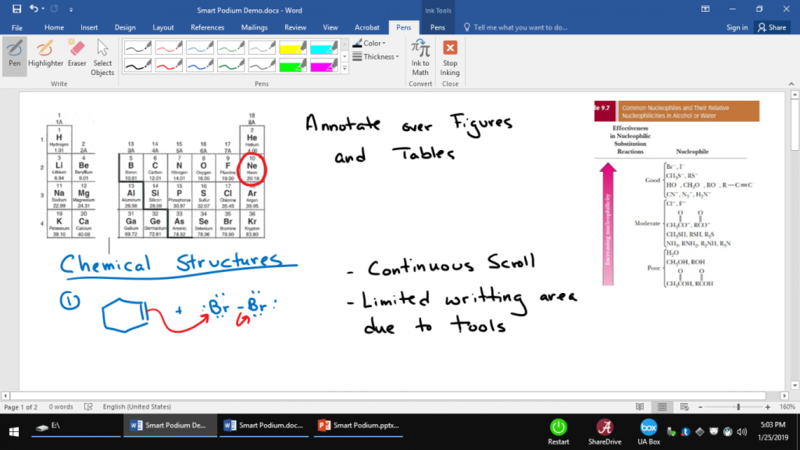 I can finish discussions outside of the lecture hall, and write on the iPad while discussing problems, or pull the handwritten notes back up easily, which would not be possible for the Wacom Smart Podium. Can choose many pen colors, highlighters, pencils, stroke thickness, page style, page settings, etc. before class, on my own time. The tools are present on the side, without clicking through menus to reach. Tools are always available to me, but not projected on the screen, so they do not waste screen space. 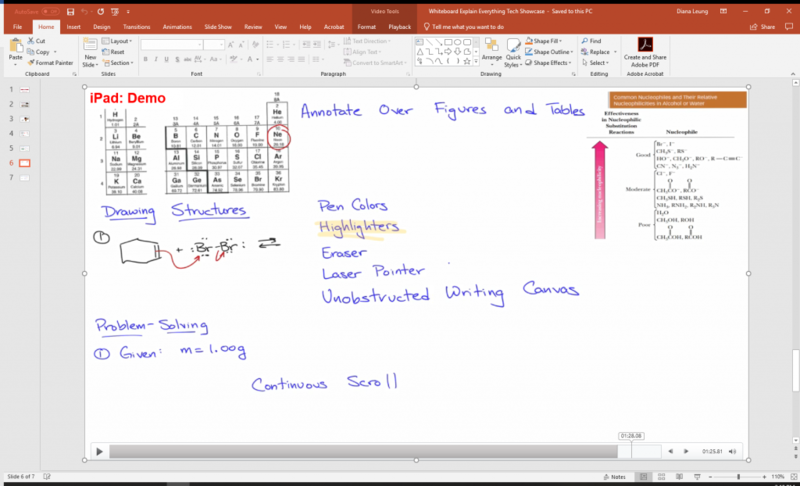 Figures/tables can be pasted onto the writing canvas for further annotation. You need to remember your iPad and Apple Pencil when going to class. Also, you will need to have them charged beforehand. On the other hand, the document camera and Smart Podium are already in the lecture halls. The instructor needs to manage this technology, with no University support. There is more cost up front. iPad, Apple Pencil, Lightning to HDMI adapter, and Explain Everything App. I hope that my experiments among the various options for projecting real-time content are useful for others wishing to find an approach to the challenges presented by large-enrollment classrooms. If you have other approaches, please do contact the Teaching Hub! Diana Leung is an Associate Professor in the Department of Chemistry and Biochemistry.